I’m not the typical superhero movie fan. I’m married to the fan. And so, as we settled into our seats in the theater to see Captain Marvel, I said, “Okay, give me the Cliff Notes version of what I need to know to not be totally lost while I’m watching this movie.” He concisely got me up to speed on where this movie fits into an overarching story, and how its characters relate to the genre’s pantheon. A couple of minutes later, I was ready to watch the movie. And more than usually expectant that I would find something in the story. I used to sleep through all of these superhero movies. For real. The visual stimulation was too much and so I would have to close my eyes during many scenes. The next thing I knew, I’d be nodding off, especially if I was wearing a breathing filter mask. But more recently, I’ve been able to watch entire action movies with my husband without having to close my eyes so much. (Except for that crazy scene with the red blinking lights in Incredibles 2. What were they thinking?) As a result, I’ve been awake for several of the more recent superhero movie releases. And thanks to my reading in the last few years of C.S. Lewis, J.R.R. Tolkien, and others on the topic of myth, I am open to appreciation of the story inside, and above, and overlaid upon, story. And so that is typically what I am now looking for in these superhero movies. For example, when we saw Aquaman in January, I came away having seen not just a story of a fish-queen and her half-human son, but a creative reiteration of the Messiah story. I remember having been taught in high school English that every story has a protagonist and an antagonist, and that there is always some form of conflict between good and evil. After having lived a while, I now understand that in a new way: It’s not just that every story has these things. It’s that there is only one story. Every story a human can live, or even imagine, is part of that story. And so, when I say that I was expectant that I would find something in the Captain Marvel movie, I don’t mean that I thought this was going to be a great movie; I mean I was expectant to find the story inside, and above, and overlaid upon, story. Carol Danvers is a human following her dream of flying jets and trying to do something good for the world. When her plane is shot down, killing her co-pilot and mentor, and leaving an important piece of technology in imminent danger of falling into enemy hands, Danvers attempts to destroy the technology using a sidearm. But in the resulting blast, energy from the technology flows into Danvers’ body, and she is knocked to the ground, unconscious. The enemy aggressor, who has witnessed the power surge, captures her. The enemy then either causes or takes advantage of Danvers’ memory loss and tells her an entirely different version of events. In his story—all a lie—she is a member of his race of being, the Kree—not human; he rescued—not captured—her; and he—not the power surge from the technology—gave her an unusual power that manifests in her hands. She is made to believe that her new power comes from a small disc device on her neck given to her by her Kree master. In truth, the little device on her neck greatly diminishes her power. But there is no way for her to know that yet. Posing as her mentor and comrade, her enemy captor trains her to fight in hand-to-hand combat, always admonishing her against feeling her emotions. He spins another layer on his web of lies, misdirecting her frustration at her inability to beat him by telling her that her emotions are the reason she can never beat him in combat. As the story unfolds, however, Danvers slowly discovers the truth. She learns who she really is, she remembers what actually happened, and she realizes the web of lies that has held her captive. Just as Danvers is about to get completely free, her enemy tries one final lie to keep her ensnared: he tells her that he gave her her power, and that he can take it away. But Danvers discerns and speaks the truth about that final desperate lie: she has been fighting with one hand tied behind her back. She rips the small disc device off her neck—the one the enemy had told her gave her the power in her hands. Immediately, her power increases exponentially throughout her entire body. The device had been limiting and diminishing her power, but now that she is free from it, she has the use of her full power—and it is significant. 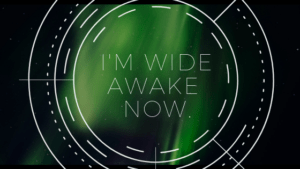 As Danvers moves forward with setting things right, a scenario unfolds in which she falls through the atmosphere from a great height, plummeting toward the surface of the earth. At first she panics, her body scrambling in its freefall. But then she appears to realize something. She becomes calm and still, even while she is still falling, and that is when her power manifests in a way that makes Danvers able to glide. She can now fly. And it was then that I cried. Right there in the movie theater. Because that is my story. And my mission. 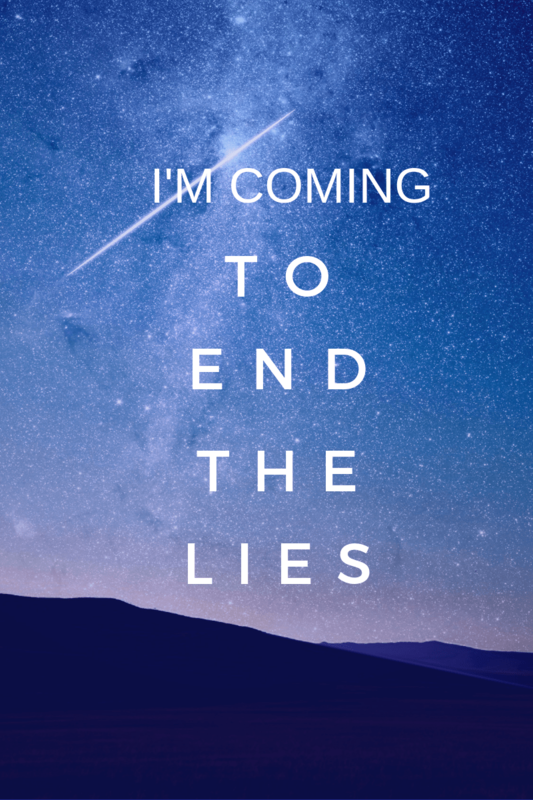 Every one of my upcoming books is being written and published to end the lies. To end spiritual battles for people who haven’t been healed. To reveal and break lies that have held believers captive for far too long because they thought it was the truth. To set people free. And, somehow, I have also taken the device off my neck. A few weeks ago, I finally recognized and exposed a lie that I had inadvertently believed, and one that had been holding me back. God’s power was freed to work fully in me. I am no longer restrained by believing something that is not true. And I am ready to experience what God’s full power working through me can do. I am on a mission, and I no longer have one hand tied behind my back. 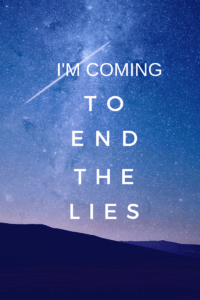 I am coming to end the lies. Get updates on my upcoming books, plus other exclusive content. Subscribe to my monthly emails at amylu-riley.com/subscribe. If you know someone who might be interested in this article, please share it. Cogent, sane, and well-rounded, Francis MacNutt’s book Healing (Ave Maria Press, 1974) gives excellent insight on the topics of healing and prayer for healing. Clearly, MacNutt has been in the trenches. He writes with wisdom, humility, and transparency. This is truly one of those Where has this book been?! books. I’m just going to cover here what were, for me, the high points, and end with a recommendation that this book is a must-read. I could not help but note, however, as I considered MacNutt’s two categories, that the suffering of Job and Paul didn’t seem to fit either. Paul’s physical suffering, a sickness experienced as a torment within his body, was also not caused “from within” Paul. It was also identified in Scripture as a messenger of Satan. 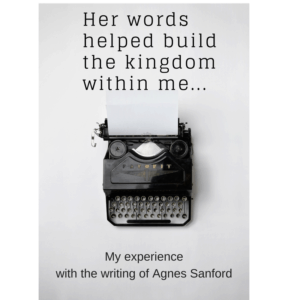 Later in the book, however, as MacNutt writes about the work of Agnes Sanford, he does say that “we are deeply affected not only by what we do, but by what happens to us through the sins of others and the evil in the world” (page 181). I agree entirely with that statement. It once again raises my previous question, however, and I seriously wondered into which of his two earlier categories of suffering MacNutt would place the “evil in the world” kind of suffering. Is it persecution, per se? My aim in pursuing this point is definitely not to argue with MacNutt (to whom I am extremely grateful for his writing of this book). It is to recognize that we will have to somewhere account for suffering and sickness that is not direct persecution by man but is direct persecution from Satan, as in the cases of Job and Paul. And we will also need to acknowledge that there is sickness which comes indirectly to a man because of the wickedness in the world (for example, a child who gets cancer from drinking contaminated water or breathing contaminated air into which carcinogenic chemicals have been discharged by industry), which may or may not be considered persecution, per se. What Should I Believe About Healing? MacNutt describes four basic attitudes toward healing that he has encountered (pages 115-119). I believe identification of these attitudes is helpful, because failure to understand this can be a spiritual and emotional minefield. As I was reading MacNutt’s discussion of the third viewpoint he describes (“Healing is ordinary and normative, but does not always take place”—which is the viewpoint he believes is most constructive), its corollary came to mind. Stephanie O. Hubach, in her excellent book Same Lake, Different Boat, brilliantly outlines her own take on various worldviews about physical infirmity. She propounds the view that physical brokenness is a normal part of living in an abnormal (fallen) world. MacNutt then shares an insight (page 205) that unlocks so much for me. Getting this concept was one of those aha moments that made me really grateful that I was reading this book. The key to having the faith for healing, and to knowing how and whether to pray for healing—the key to any and all of it—is to first pray to know the will of God in a particular case (either for oneself or for someone else). The key to having the faith for healing… is to know the will of God. Once God has revealed his will in the given case, then I can pray with full confidence for his will to be accomplished. This is why Elijah’s prayer was successful. Elijah modeled this type of involvement with God. God told Elijah to present himself to Ahab and that God would send rain (1 Kings 18:1). Knowing the expressed will of God, Elijah obeyed the instructions, and discerned when specifically to pray for the rain that God had already told him was his will. At the right time, Elijah prayed seven times that it would rain, and when his servant reported seeing a cloud the size of a man’s hand (that’s a small cloud), Elijah knew God’s will was being done (1 Kings 18:41-45). Elijah had been involved in bringing about God’s will, and his involvement had stemmed from knowing God’s will. I expect that Elijah’s habit of listening expectantly for God was probably why Elijah had had the opportunity to become clearly aware of God’s will in the first place. That is a clarion call to me. Another excellent point MacNutt makes on the point of seeking God’s will in a particular case is that the gift of knowledge and the gift of faith go hand in hand (page 126). By having God’s will made to known to a person, the person can then pray without reservation—in faith—for God’s specific will. MacNutt discusses this all in the context of healing, obviously, but I think that Elijah’s example demonstrates that the same principle applies broadly to all areas of life. As I was first scanning the table of contents of Healing, I saw a chapter titled Eleven Reasons Why People are Not Healed. Do you think I didn’t flip immediately to that chapter first and read it in one sitting?! As one might expect from the chapter title, MacNutt lists and discusses eleven reasons people are not healed. They all make sense, and some of them are real eye-openers. I am totally in love with what MacNutt says (page 249) about how important it is to understand the reasons people aren’t healed, so we can get our faith aligned correctly and pray correctly. It’s important to understand the reasons people aren’t healed, so we can get our faith aligned correctly and pray correctly. Without that, we can do a lot of damage to ourselves and others. I may have buried the lead in this blog post, because I really can’t tell you how excited I am about MacNutt’s discussion of James 5:14-15! MacNutt discusses the Scripture passage with the kind of wisdom and knowledge I have been searching out for a long time. If you’ve ever wondered why I read so many books about healing; one of the reasons is that I’ve been looking for some specific answers about translation issues and other matters in this specific passage. If you’re a person whose healing hasn’t come, even after you’ve been prayed for and anointed with oil as James 5 instructs, I’d guess you may know what I’m talking about. If you’re a person whose healing hasn’t come, even after you’ve been prayed for and anointed with oil as James 5 instructs, I’d guess you may know what I’m talking about. I have been over so many miles of rough road with James 5:14-15. I won’t unpack the whole story here, but it will definitely be included in my upcoming book. After actual years of literally searching for answers about this passage, my questions about it have finally been addressed. MacNutt exactly understands and addresses my problems with the passage. Here in his book—finally—I found the precise answers I have been seeking. Whether you are a person in need of healing (and MacNutt says that by virtue of being human, we all get damaged and need healing, page 290), or a person who is praying for others in need of healing, I will be so bold as to say you owe it to yourself and others to give this book a read. By virtue of being human, we all get damaged and need healing. The church—that’s us—needs to grow up and get wisdom in this area, and MacNutt’s Healing goes a long way toward helping us do that. I’m so grateful for this book. 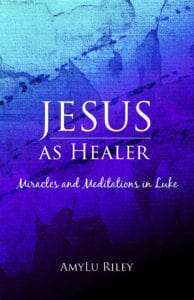 AmyLu Riley is the author of Jesus as Healer: Miracles and Meditations in Luke. Her upcoming book for people who are not yet healed is designed to build faith and dissolve spiritual discouragement. To get book updates, sign up for her email list. Reading John Wilkinson’s The Bible and Healing: A Medical and Theological Commentary (The Handsel Press Limited, Great Britain, 1998) was like having a conversation I have been waiting to have for a long time. I am very grateful to have found the book. And although the author is no longer living, that didn’t stop me from having a conversation with his book, some of which I will share here. I found the book fascinating as well as sensible. I appreciated its combination of scholarship (especially with regard to Greek terms and biblical history, without being too much) with a common sense approach to understanding and applying Scripture on important topics related to healing. Wilkinson’s discussion of James 5:13-16 was especially welcome to me. I personally struggled with this passage over a period of years, finally reaching certain conclusions—all of which I plan to include in an upcoming book I’m writing about faith and the wait for healing. It was refreshing (and frankly, a relief) to learn that Wilkinson, by his more scholarly route, had reached similar conclusions about the passage. The way he pulled no punches in this discussion was also a breath of fresh air. On another topic, the precise identification of Paul’s physical thorn in the flesh, Wilkinson’s book changed my mind. Wilkinson made a decent case against the thorn’s having been an eye problem (page 220-221). Blindness had been my previous assumption of the nature of Paul’s thorn, and on first reading of Wilkinson’s evidence against the eye theory, I was not quite as ready to throw out the diagnosis as Wilkinson was. However, upon closer examination of Wilkinson’s chapter 18, I came to understand that his case really hinges on a point about the tense of two Greek verbs Paul used in 2 Corinthians 12:7 (huperairo and kolaphizo). Wilkinson wrote (page 223) that the present tense verbs used by Paul in this verse implied that his thorn was a recurrent physical problem that returned at intervals. Therefore, my former idea that Paul suffered blindness would be out, since that condition would be a permanent, not intermittent, one. Wilkinson seemed quite fond of the malaria theory of identification of Paul’s thorn, and he did make a good argument—interesting and plausible—for that diagnosis’s fitting the facts of Paul’s situation (pages 222-226). Wilkinson and I agree, however, that it doesn’t matter now what the thorn was, but that the lesson is in the principles of Paul’s situation. And Wilkinson gave an excellent discussion of those principles. On that and every other fascinating topic addressed, it seems to me that Wilkinson majored on majors in this book. He included topics that are important to individuals and the church today, in a very readable way, with good depth of understanding and scholarship (and with a welcome dose of debunking of unhelpful commentary). As much as I appreciated the book and feel I can recommend it as an excellent read and resource, there were a few topics (representing only a handful of pages of the whole) on which I couldn’t agree with the author. I would love to have conversed with him further to gain a deeper understanding of his positions on those points. I’ll cite three examples here. Wilkinson wrote, “…there is no reference to Elijah’s prayer for the end of the drought in the Old Testament narrative, although it may be assumed that such a prayer was offered by Elijah” (page 242). However, it seems plain to me that 1 Kings 18:41-45 is precisely the account of Elijah’s prayer for the rain that ended the years-long drought. Another example (page 185), is Wilkinson’s statement, “There is no specific instruction about healing in the Old Testament.” This assertion seems to overlook the instruction of God to Moses about healing of poisonous snake bites among the Israelites, recorded in Numbers 21:8-9. A third example—and one about which I dearly wish I could converse with Wilkinson, since he gave no supporting citations or arguments for his statements—is his brief discourse on page 185 about the nature of Jesus’ resurrected body. Wilkinson’s position is that the post-resurrection body was already Jesus’ glorified one and that it contained no blood. I can think of so many Scriptural points that seem to me to contravene this theory that I truly wish I had insight into what caused Wilkinson to take this position. I’m sure it would be fascinating. A scan of the topics in this book’s table of contents is like a who’s who of many of the topics I most care about when it comes to the Bible and healing. I read the book voraciously and sincerely wished I could set up a meeting with Wilkinson to discuss many of the points he made. I found the book very helpful and encouraging, and recommend it. I recently had a new headshot made. 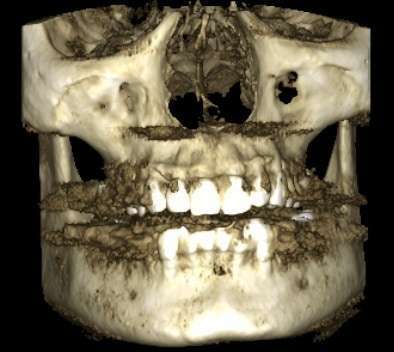 No, I didn’t forget to brush my teeth that morning. That stuff that looks like garden dirt is part of my face. The Bible may contain poetry and imagery, but Genesis 3:19 is also literal. This body is made from dirt. When you see what a physical body is made of, it’s so clear that it’s temporary. 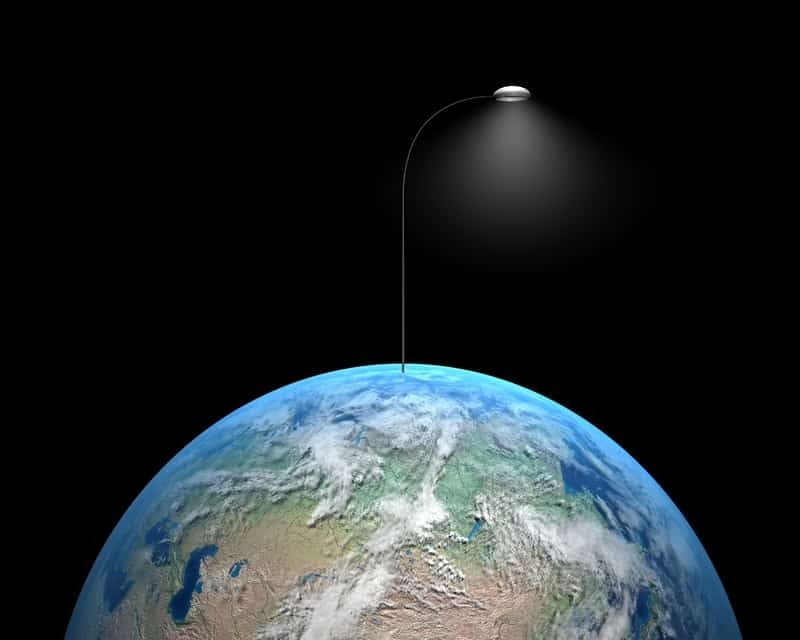 One day in the future it won’t require any technology at all to see the view this image revealed. But I don’t find this macabre. I think it’s a miracle. That God ever got any of these bodies working and off the ground in the first place is amazing. Seriously. Who makes something this complex out of dust, breathes into its nostrils, and it works? Sometimes I can’t even get a plant that’s already alive to continue to live and grow in dirt. Never mind trying to make something out of dirt that will live. After I got done laughing about my dirty face, I had the same thought I usually have any time I am reminded what these bodies are. Since I’m clearly in a body made of dust and headed back to dust, I would do well to get on with what God put me in this body to do. That’s not a new idea. It’s just a reminder of the same guiding principle I already live by. It doesn’t scare me to know I’m partly a jar of clay, because my spirit–the same one that now lives with my body of dust–will go on living. I would only be afraid to die without completing the work I was put here to do. Truth like that is motivational to me, actually. Fresh reminders of my transience provide me the opportunity to reaffirm that I am doing what I was put here to do, and motivate me to diligently continue. New Book Coming: Here’s a taste of what’s coming in my next book. 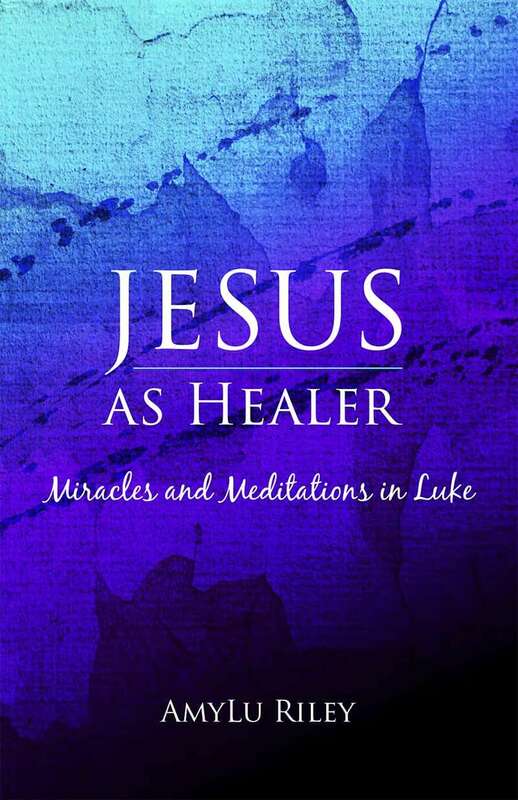 Ebook Now Available: I’m excited to let you know that my book Jesus as Healer: Miracles and Meditations in Luke, previously published in paperback, is now also available as an ebook! Check it out and buy a copy for yourself or someone else. I’ve only recently met Agnes Sanford. At first, I disagreed with her so vehemently on a certain point that I nearly gave up on the relationship before it had begun. But I sensed that she had much more to say that I needed to hear, and that I could learn from her, so I continued to listen. For one thing, I realized by sticking with Agnes long enough to hear her explain her entire viewpoint, that the reason I had so vehemently disagreed with her at first was that I had interpreted what she initially said in a different way than she actually meant it. By being patient enough to hear her out, I realized that what I originally thought she meant wasn’t at all what she was saying. You might be wondering what was going on, since Agnes Sanford has been gone since 1982. A book, of course. Even after I grasped her concept, while I still didn’t entirely agree with her, I could definitely at least see things from her perspective, and I was curious. The opening that had been created in my understanding let in more peace and more light than I had previously had on the topic. It’s not every day that happens, so I decided it was well worth sticking around for a little while longer. So I read the whole book. And then, after I finished reading Healing Light, I had the sense that there was a lot more that Agnes knew and hadn’t said in that book, and I wanted to know what it was. I already had a copy of her autobiography, Sealed Orders, so I immediately launched into that book. Well, that’s the one I wish I had read first! I’m pretty sure that I wouldn’t have come so close to chucking her if I had known how she had arrived at her ideas described in Healing Light. But, that was water under the bridge. I was here now. What a book. Sealed Orders is the story of a writer, a woman, a pray-er, and best of all, someone who expected her Christian faith to grow and who constantly held spiritual ideas in tension and watched for God to guide her. Once she received God’s Spirit, she lived by the Spirit. I’ve seen this book called Sanford’s spiritual autobiography. I find that distinction interesting, because while it is absolutely her spiritual autobiography, it is also her autobiography. Maybe every autobiography is really a spiritual autobiography, but most people’s lives just don’t have many lines or much action for their spirits: maybe the spirits of most lives just hang out backstage, waiting for a chance to act. That was definitely not the case with Agnes. I found especially interesting her tracing of her development as a writer, and how the various aspects of her full life—which sometimes appeared to her to be detours from writing, obstacles in the way of writing, or complete roadblocks to writing—in fact seem largely to have formed the very material that became her oevre. Indeed. As if God has said to the writer, “Here is the clay of ideas I have selected for you to use; take it and fashion it.” And the writer will be enlivened by the Holy Spirit to do so, but there is a style, a perspective, a voice, that is her own. She has been made by God, so of course any work she dedicates to his honor will also bear his imprint, but he has given her her own capacity for shaping and making an imprint on it, as well. Oh, Dorothy. Not to put too fine a point on it. 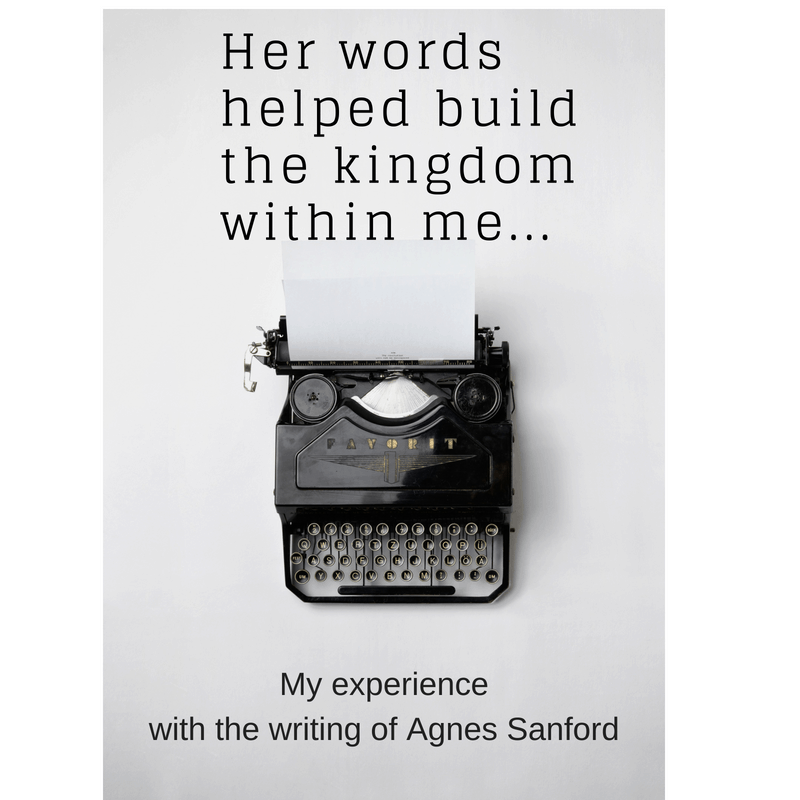 And I have to tell you, after reading Sealed Orders, I’m feeling a lot more raised, because Agnes Sanford’s story helped rebuild the Kingdom within me. 1 Sanford, Agnes. “Chapter 13.” Sealed Orders, Bridge-Logos Publishers, 1972, p. 202. 2 Sanford, Agnes. “Chapter 13.” Sealed Orders. Bridge-Logos Publishers, 1972, p. 203. 3 Sanford, Agnes. “Chapter 13.” Sealed Orders. Bridge-Logos Publishers, 1972, p. 203. 4 Sayers, Dorothy L. “Dante and Charles Williams.” The Whimsical Christian: 18 Essays. New York, N.Y.: Macmillan Publishing Co., Inc., 1978. 180-204. Print. They retain the power of the spirit that whispered them—whatever spirit that was. the power of that spirit is unleashed in the world. I was peeling a cucumber yesterday and thought of the whining Israelites and their cucumber craving. This cucumber was part of our weekly CSA farm share pickup, but I won’t be eating it. I have a large number of food sensitivities, so cucumbers are just one of dozens of foods that I like but won’t be eating any time soon. I don’t complain about it. You can ask the people who know me: I don’t whine about the foods I can no longer eat. Not so the Israelites. They fell into grumbling about the food they could no longer eat—foods they had left behind in Egypt, the land of their long slavery—while God was in the process of rescuing them, refining them, and forming them into something new. He was preparing them for a new place, for a new way of life with its own good things. Manna was a seedlike substance with a shiny appearance like resin. The people went around collecting it and ground it between stones or pounded it fine in a mortar. Then they boiled it in a pot and shaped it into cakes. It tasted like a delicacy cooked in olive oil. When the dew fell on the camp at night, the manna was right there with it. There are no cucumbers in the desert. But there is usually no manna there, either. And it was all they really needed. There are no cucumbers in the desert. But there is usually no manna there, either. You know what else wasn’t in their particular part of the desert? Enough quail to feed more than half a million people for a month (Numbers 11:21-23). But God had quail flown in (Numbers 11:31-34). So much quail. And he struck the people with a severe plague because he was so angry with them for rejecting him again (Numbers 11:10). Graves of Gluttony is what the Israelites named the place in the desert where they buried the people who had rejected God in this weird way that sounds so harmless: craving meat from Egypt and wishing they were back there (Numbers 11:34). When you are rescued by God from one place, and he is carrying you on his back to a new place, this is not the time to whine about wanting cucumbers like you used to have. That is a sign of ingratitude. It demonstrates a focus on the wrong things. What the Lord does not put before you, he does not intend for you. 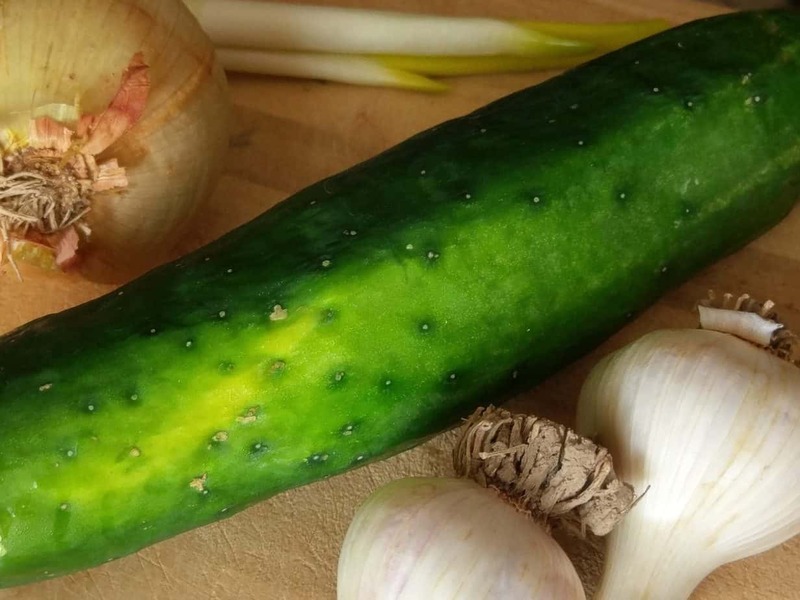 If God has provided manna for nourishment in the desert—when he could have provided anything—or even nothing—be grateful for manna and shut up about cucumbers. The Israelites’ problem had started earlier. As most things do. This particular episode had been brewing since they left Sinai, the mountain of the Lord (Numbers 10:12, 10:33), during the second year after their dramatic rescue from Egypt (Numbers 10:11). You can hold your breath for a year, but after that, when it starts to look like your situation isn’t improving, it gets harder. And, of course, the enemy always provides plenty of opportunities for ingratitude. A well-placed comment that doesn’t even sound bad can quickly flip the switch of ingratitude and complaining (Numbers 11:4-6 and 11:10). Those sound like minor infractions, until I see that God linked the Israelites’ whining (Numbers 11:18) to rejection of the Lord (Numbers 11:20), and treated it an offense punishable—and punished—by death (Numbers 11:33-34). They didn’t want the God they had, a God who would make them march across the wilderness of Sinai and Paran and feed them manna (Numbers 11:6-9). They wanted cucumbers and melons and onions and leeks and garlic and fish and oppressive slavery (Exodus 1:11-14) under a regime that had killed many of their infant sons (Exodus 1:22). They wanted golden idols of beef to worship (Exodus 32) and meat to eat. But manna and marching was all this God seemed to offer. They had been rescued by a God who didn’t appear to be rescuing them. Their lives still weren’t perfect. What good was freedom from cruel slavery—without cucumbers!? What good was freedom from cruel slavery—without cucumbers!? Moses, their human liberator, was very aggravated with them (Numbers 11:10). God, their divine liberator, was extremely angry (Numbers 11:10). And I’m wondering if maybe, even though I don’t grumble about cucumbers or fish or melons, I’m no better than they were. After all, I said I wanted God to lead me, and I said I would follow. When things became really imperfect-looking at some point, I assumed—as the Israelites probably did—that it was just a short-term jaunt through the desert, a quickish (or maybe even medium-ish) jaunt from point A to point B. 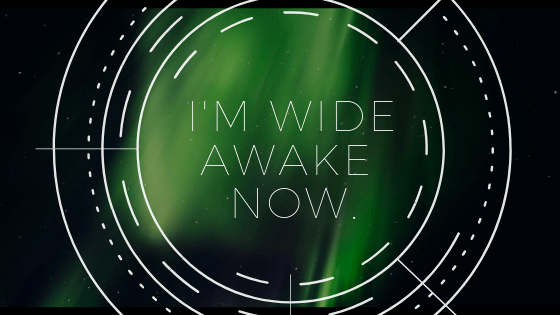 But after a few years, when I notice I’m not at B, and I can’t even see it from here, and I’m not even sure that B is where this God is headed at all, I find myself at the doorway of a tent in the wilderness (Numbers 11:10). I can either whine about cucumbers and the other things that aren’t in the desert, or I can be grateful that the Lord is here with me (Numbers 11:20), and that he keeps putting just enough manna on the ground for each day (Numbers 11:9). AmyLu Riley is the author of Jesus as Healer: Miracles and Meditations in Luke. Her upcoming book explores questions of gritty faith for the not-yet-healed. Sign up for email updates. Scripture quotations marked (NLT) are taken from the Holy Bible, New Living Translation, copyright ©1996, 2004, 2015 by Tyndale House Foundation. Used by permission of Tyndale House Publishers, Inc., Carol Stream, Illinois 60188. All rights reserved. It was like that showdown scene in the movies. The situation had reached crisis pitch and someone was being called to answer for the ways things had gone. Job was demanding that God answer for his mortal suffering. But that wasn’t quite how things played out. God had listened to every word Job had said to him and about him, and God did respond, but not to answer for anything. God would be the one asking the questions. And then God gave Job an earful. Through God’s questions to Job, God demonstrated his detailed care for his creation—and that humankind is not capable of comprehending what the all-knowing, all-powerful God is doing (Job 38-40). God’s message to Job in a nutshell: I’m God and you’re not. Like Job, I get it backwards. I think that God should tell me specifically why my problems are necessary and what he is doing—and that I could understand the answers. But God’s reply to Job reveals to me that I could not comprehend it. We simply can’t see it from here. However, that doesn’t mean God wants me to stop communicating with him about my pain, or that he will not communicate with me. The Psalms (Psalm 40 being a prime example) encourage me that God wants to hear what I have to say, even when my immature soul and my unrefined spirit are babbling nonsense to him. Just as he did with Job and with the Psalmists, God will take my chin in his hand, and redirect my gaze to where it needs to be to see that he is my advocate and that he is saving me. He is the one who can help me. He loves me and I just need to trust him, even when his methods appear… painfully awry. Do you—like Job—have some questions for God about what he is doing? My upcoming book (release date not yet announced) is for those who are traveling a difficult road and need for God to gently cup their faces in his hand. Subscribe to my emails for book updates. Reading Dorothy L. Sayers’ The Mind of the Maker has gotten me thinking of something about which I wish I could pick her brain: whether I’m really the one doing my own creative work. I imagine we’d have a lively discussion, and that Dorothy would surprise me with her input. But I can’t ask her, so I’m going to write about it, and look for my answers elsewhere. In The Mind of the Maker, Sayers explores how God the Father, Son, and Spirit are active in the work of a human artist, and in what proportion to each other, and—by extension—how they contribute to and affect the end product of that artist. Sayers also explores the ways and degrees to which an artist is expressed in his or her own work. By all appearances, Sayers assumes the artist to be a central actor in the making of his or her own creative output. But my question is one that Sayers doesn’t touch on at all in The Mind of the Maker. It is this: In light of Galatians 2:20, does the human artist—submitted to the Father, Son, and Spirit—actually do his or her own work? In light of Galatians 2:20, does the human artist—submitted to the Father, Son, and Spirit—actually do his or her own work? Since Scripture asserts that there is no good in me and that I am dead and that it is Christ who lives in me, then when I create something, is it even I doing it? And if so, how is it I? Does God alone do the creating, using my mind and body as instruments? And if so, then what part did I really have in it? None? Am I, as Mother Teresa said, but a pencil in the hand of God? I am still left wondering how much of me is really even doing my own work. My mind scans the Scriptures for any answer. I think of Bezelel and Oholiab being given artistic ability to make the articles and furnishings of the Tabernacle and to teach others to help them with the work (Exodus 31:6). But everything they made was according to specific patterns and instructions given by God, and derivative of what already existed in heaven. So did it even matter whether it was Bezalel and Oholiab—or any other two people—who did the crafts? Wouldn’t the pieces have looked exactly the same, given this situation, regardless of whose hands they passed through? I can think of two possible answers for that. It mattered to them. It made a difference to Bezalel and Oholiab as individuals, and to each skilled worker who received such gifts, that they were chosen to do the work and that the gifts were worked through them. It mattered to their experience of God and to their personal relationships with God. First: It mattered to them. It made a difference to Bezalel and Oholiab as individuals, and to each skilled worker who received such gifts, that they were chosen to do the work and that the gifts were worked through them. It mattered to their experience of God and to their personal relationships with God. It also mattered to them because it shaped the course of their lives in a daily way while they worked on their assigned projects, and probably, if I had to guess, for a long time after the Tabernacle was completed. Second: Each person’s unique human stamp would have necessarily been put on the work. Work of two artists may also be of the exact same level of quality, yet different. I must allow for the possibility—although I do not know if this was the case—that some image of a pomegranate rendered by Oholiab may have been distinguishable from an image of a pomegranate worked by Bezalel (Exodus 28:33), in that same way that a famous musical composition, played impeccably by two different accomplished pianists may still somehow be distinguishable as being played by this one, or that one—not even as objectively or subjectively better—but just in a noticeably different style. 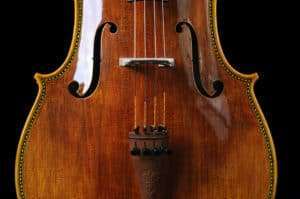 Work of two gifted artists may be of excellent quality, yet there are times when the creative output of one of the artists is perceivable by everyone to be unmistakably superior. Even an untrained eye or ear can recognize this (as anyone who has listened to The Hallelujah Chorus from Handel’s The Messiah can appreciate). However, this principle is not limited to original composition. It is even true in the execution of some “pattern” by two different outstanding artists, such as in the previous, visual arts example of a pomegranate, or in the performance of the same musical score by two musicians. Isn’t it easy to distinguish between the playing of Yo-Yo Ma—and any other cellist alive, no matter how accomplished? None of this answers the original question, however, but just brings me back to it. If two pianists are equally good, yet different, I still don’t know whether that difference is because of their own contributions, or solely because different facets of God are on display through them. If Yo-Yo Ma is a better cellist than other cellists (and I think it is so), is that difference really Yo-Yo Ma himself? Or is it the genius of the divine working through him? This is where Dorothy would jump in. Copyright 2018 by AmyLu Riley. All rights reserved. 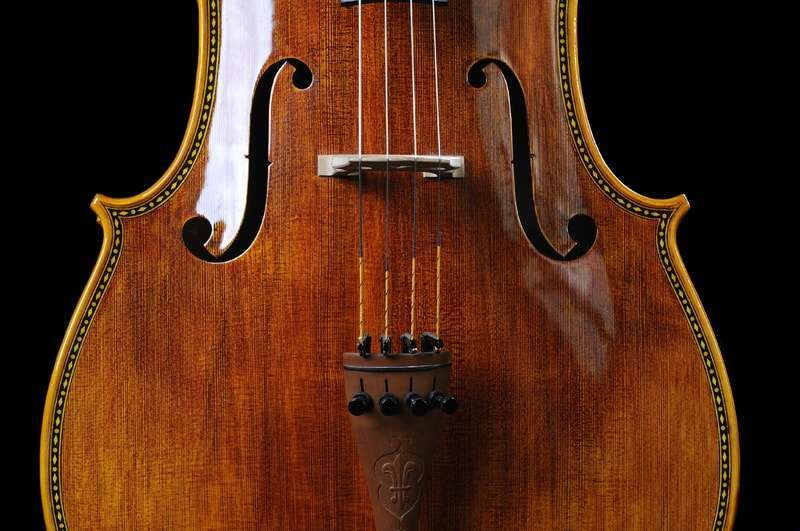 Cello image © Jeffbanke | Dreamstime Stock Photos & Stock Free Images.